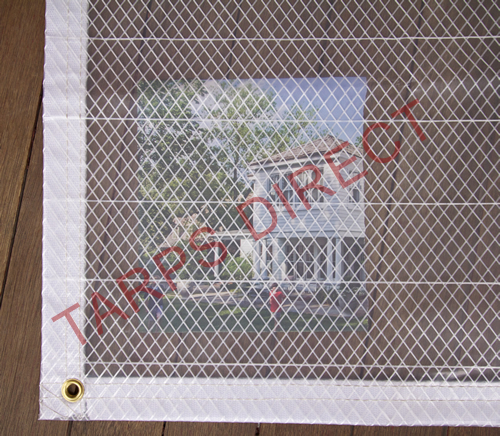 Tarps Direct's clear poly (10 HUV) reinforced tarps are 7 oz. per square yard with a 10 mil thickness. The 10 HUV is used in applications that need light weight yet strong material with good light transmission. This product responds to tears immediately by surrounding and stopping the tear with its reinforced diamond pattern, heavy-duty scrim that is laminated between the outer sheets of clear, high-strength polyethylene. Grommets are placed approximately every 18 inches apart and in corners of white reinforced two inch wide web hem. Common uses include construction and scaffolding enclosures, temporary walls, vapor barriers, remediation and fumigation covers enclosures, temporary walls and many other applications. If you need a clear option without the scrim, please check out our 20 mil or 30 mil options. Tarps Direct's clear poly (10 HUV) reinforced tarps are 7 oz. per square yard with a 10 mil thickness. The 10 HUV is used in applications that need light weight yet strong material with good light transmission. 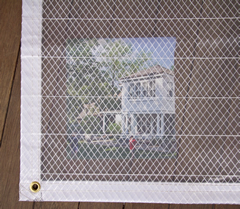 This product responds to tears immediately by surrounding and stopping the tear with its reinforced diamond pattern, heavy-duty scrim that is laminated between the outer sheets of clear, high-strength polyethylene. Grommets are placed approximately every 18" apart and in corners of white reinforced two inch wide web hem. Common uses include construction and scaffolding enclosures, temporary walls, vapor barriers, remediation and fumigation covers enclosures, temporary walls and many other applications.